Mason Mayor Donna Dennis, right, is shown as she is sworn into office Wednesday by Recorder Ciji Casto. Two new members of the Mason town council, as well as returning members, were sworn into office during an organizational meeting on Wednesday. Pictured, from left, are Ray Varian, new member Ron Heath, Emily Henry, and new member Becky Pearson. The oath of office was administered by Recorder Ciji Casto, right. Councilman Marty Yeager was later sworn in during the meeting. 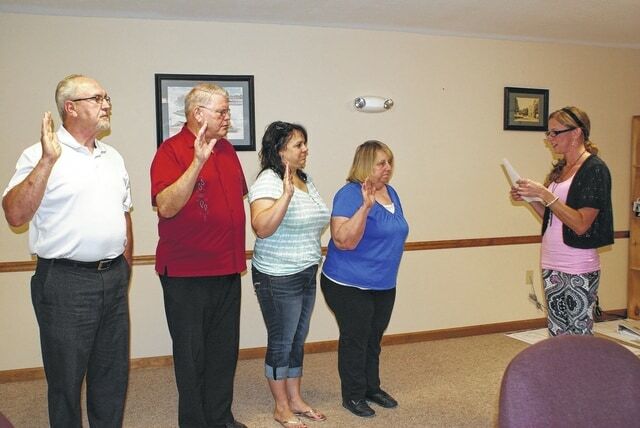 MASON — Officials were sworn in, signifying the beginning of a new term of office, when the Mason town council met Wednesday. New council members Ron Heath and Becky Pearson, as well as returning Mayor Donna Dennis, Recorder Ciji Casto, and council members Ray Varian, Emily Henry and Marty Yeager, set meeting dates and received their committee appointments. The council will continue to meet on the first and third Thursdays at 6:30 p.m. Mayor Dennis appointed Pearson and Heath to the streets committee, Varian and Henry to the parks and recreation committee, Yeager to the dilapidated properties/building inspection committee, and herself as police commissioner. The mayor listed accomplishments of the prior eight months, after she was appointed to office. Street paving, employee pay raises, and upcoming sidewalk, water and sewer projects were among them. She asked council for input on goals for the next two years, with suggestions including attracting new businesses and getting more dilapidated properties removed. There was an inquiry as to zoning for business made during the meeting. Mayor Dennis said she will look into the matter further and get back with the representative wishing to establish either a restaurant or liquor store. The council discussed a police officer who did not pass the physical agility test at the academy for a second time. He has been released from his duties at Mason. The mayor said the officer has been given the chance to try a third time at his own cost. The council will then have to decide if they want to hire him back if he passes. Council member Henry discussed final plans for the Fourth of July celebration. She listed the games set for the park, as well as prize money. It was also decided the town would sponsor a float contest, with the prizes being $50 for first place; $30 for second; and $20 for third. She also discussed the possibility of having fireworks at the Harvest Festival in the fall, and asked that a date be chosen soon so preparations could get underway. Approved minutes from the previous meeting and bills for payment.